FarmLink is a company limited by guarantee with charitable status dedicated to educating school children about farming, food production, healthier eating and the environment. This is accomplished by FarmLink visiting schools through the winter terms and then children visiting farms through the spring, summer and autumn terms studying a subject of the teachers choice all linked to the National Curriculum. 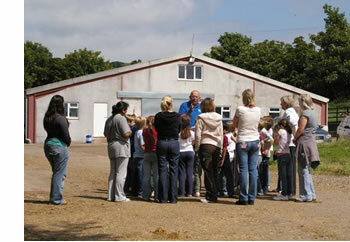 In both school and on farm the lessons are innovative and fun and inspire the children to want to learn. The results are always positive and the children always look forward to a visit to school by FarmLink or by them to the farm. To bring the classroom to the countryside and the countryside to the classroom. To develop a programme of education and training based on active, imaginative and novel ways of covering National Curriculum topics outside the classroom using farm visits as a resource to combine with school based activities. In conjunction with others to allow every child in England and Wales to visit a farm at least once a school year to gain an appreciation of how food is produced, its impact on the countryside and recognise the part they can play in shaping the local environment.